Life with a toddler is busy! From early mornings, to preparing meals and snacks, to playing…there is never a moment to stop. In our home, my little man and I are always on the go. Because we live out of the city in a rural community, any trip we take is at least 30 minutes in the car, which means we are usually never home for lunch. In the summer I pack a picnic and wherever we end up we have a delicious, healthy, home cooked meal. Our picnics usually occur in our favourite parks, depending where we are, and always include water. We both love being by the water and enjoy sitting on a blanket, usually under a tree, eating and watching the water. Bliss. As you can see, our Wean Green cubes always head out with us. On this particular day, they were filled with cashews and a homemade muffin. Inside the large tiffin was a salad for me, raw vegetables, hummus and crackers and fresh fruit. 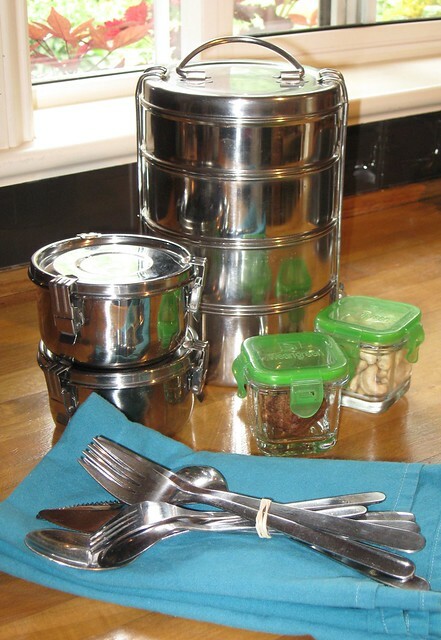 The smaller stainless containers held snacks – a crispy rice square and more fruit. It doesn’t matter where we are; my little man and I always enjoy a wonderful lunch together. And just in case you too are leading a busy life with your toddler, here’s an easy to prepare kid friendly snack which can be taken on picnics, in the car or enjoyed at home. Heat brown rice syrup, vanilla and almond butter in a saucepan over low to medium heat until the mixture is easy to stir. Remove from heat. Working quickly, add the dry ingredients and stir well to coat. Divide mixture into a baking pan and press flat. Let cool and cut into squares. Extras keep well in the freezer. This entry was written by Melissa, posted on December 14, 2011 at 6:31 am, filed under Feeding Weaners & Families, Wean Team-Guest Bloggers and tagged children's nutrition, healthy eating, traveling with children. Bookmark the permalink. Follow any comments here with the RSS feed for this post. Comments are closed, but you can leave a trackback: Trackback URL.